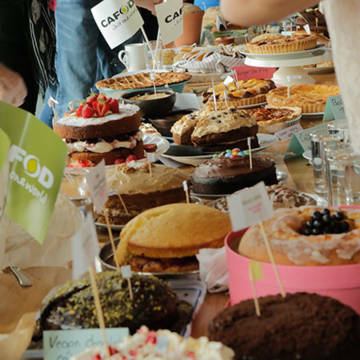 Follow our seven simple steps to help you fundraise for CAFOD - whether you're running a marathon or holding a bake sale, serving up a curry or setting a quiz! Keen to get started straight away? Download our sponsorship form, or set up your Justgiving page today! You can do absolutely anything to raise funds for CAFOD, from organising a sponsored cycle ride to holding a black tie ball! We have handy one-sheet guides to help you plan your fundraiser, covering a variety of events, including a bake sale, curry night and sponsored walk. Do you need a venue? For a small party, your home or church hall could be perfect. If you need a larger or licensed venue, a school or pub may work. Let the venue know your event is for charity and they may be able to offer you a discount. Don’t be shy to ask friends and family. Once you have your team of volunteers, give everyone a specific task, so that you’re not doing everything yourself. Get in touch with your local CAFOD office – they can share local knowledge, as well as help to publicise your event in your diocese. Approach local businesses for raffle prizes or donations. You could offer them some free publicity in return. Contact us if you need an authorisation letter to use. Don’t be afraid to ask everybody you can think of for help and donations. A personal approach often works best, both with friends and local businesses, so talk to people or email them individually. Let them know why you’re raising funds as well as how. Decide how much you want to raise and set up a Justgiving page with this target. Think about how you can hit your target. If you’re organising a quiz or a concert, you might want to start selling tickets in advance or hold a raffle on the night to raise funds. Keep careful track of money coming in and out so that you don’t spend more than you make. Try not to spend more than £1 for every £4 raised. Get in touch if you’d like advice before committing to any costs – we’re here to help! Ask your employer if they have a charity matched-giving scheme. They could make a big difference to your total by matching some of the money you raise, especially if you’re holding your event at work. Once your plans are in place, spread the word. The more people who know about your fundraising, the more money you can raise! Use our top ten ideas to get your event noticed! There are a few things you need to keep an eye on while planning your event. Check our advice page to make sure your event is both legal and safe. By phone – call 0303 303 3030 to make a payment with a debit card. Remembering your - sponsorship form, collection envelopes or gift aid declaration slips. If you ask donors to complete their details and tick the Gift Aid box on any sponsorship forms or donation envelopes you use, we can receive extra funds from the government. For example, if you Gift Aid a donation of £20, we receive £25 in total. Please send completed sponsorship forms and collection envelopes to us, even if you pay over the phone or online. If you want to thank a particularly generous or helpful person who supported your fundraising, please email events@cafod.org.uk and we can send out a personalised letter. If you're holding a bake sale, curry night, bike ride or quiz, don't forget to download our toolkits for extra help!